Any trip to Europe is special, but the one I took this year with my daughter-in-law, Jenny, was extra special. Upon making what was a - “just us girl’s”- trip to Greece and its islands to view the sights and learn about ancient Grecian history, we found ourselves in the midst of modern Grecian history in the making. 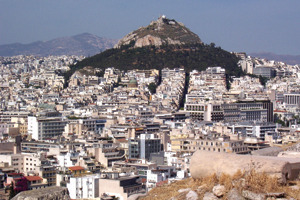 Upon approaching Greece it was surprising to discover that although it is bordered by the beauty of the eastern Mediterranean Sea, it is an arid, mountainous and rock-filled country, with five million of its ten million people choosing to live in its largest city and capital, Athens. Within this crowded and noisy city, a mass of autos, motorcycles, taxis, buses and cable cars - maneuvering tenuously for limited road space - assails the senses. With traffic signals few and far between, the road warriors there (and that is what one must be to drive in Greece) are controlled mainly by roundabouts and the honking of horns. Vehicles are parked in a puzzled maze with cars and motorbikes angling themselves in all directions, some even coming to rest upon the sidewalks. Many autos have at least one dent, if not more, and unlike most motoring owners in the USA, no one seems to mind. Graffiti is scrawled across walls everywhere, and apartment buildings are squeezed in-between stores and professional buildings no more than the limited five stories high. Convenient public transportation connects residents, workers and visitors to all parts of the sprawling city. And as a bustling population hurries to and fro fulfilling their daily obligations … restaurants, bars and coffee houses host elderly Greek males, leisurely playing backgammon or checkers, smoking cigarettes and drinking ouzo. In fact … everywhere you go people are smoking. A profoundly religious country, Greece consists of a population that is 97% Christian Orthodox, and most Greeks owe their names to a religious saint of their church. Theirs is a faith expressed in the presence of beautifully constructed and ornately decorated churches found everywhere you look throughout the city - in the squares, parks, and even perched high atop the surrounding hills. And intertwined with their religion, are myths about gods and goddesses which are the foundation of much of their history. Majestically located at the capital’s center is Constitution Square. Surrounded by ancient monuments, works of art, exquisite gardens, entertainment arenas, government buildings, business offices and high end shopping districts, it is the hub of all the major happenings in Athens. And high above it on a mountainous plateau overseeing it all, sits the Acropolis, home to the Parthenon, the original center of life in the ancient city. Located defensively on the highest ground there, the Acropolis contains the remnants of what once were the chief municipal and religious buildings of those historical times. Towering over the capital it’s a very impressive sight, and walking on its grounds and thru its ruins gives one a feeling of awe and a true sense of the greatness of the ancient Greek builders. It is a site that can be viewed from anywhere in the city, and is a most pleasurable view at night when lit up for all to see. A two hour ferry ride or short plane hop brings one to the island of Mykonos from Athens. Although definitely not a tropical island, it is exactly as pictured in travel magazines and films, with white- washed buildings, pastel shutters and fragrant flowering plants in abundance. Winding cobblestone streets - which according to legend were built to confuse sea-faring pirates – wend their way throughout Mykonos Town. Within its confines are a myriad of shops, churches, residences, and even a school. While shopping there it would be wise to purchase anything you like right away. If you plan to return later the shop might be difficult to find again among the many twists and turns in the village. When hunger strikes a plethora of restaurants line the seashore of the town, awaiting your pleasure … their many proprietors annoyingly urging you to select their establishment. Evening dining for most Greeks begins at 8 pm, and meals are prepared with only seasonal fruits and vegetables. Menus include items like baked sesame seed encrusted feta cheese appetizers, Greek salads of varying kinds, grilled vegetable filled crepes, selections of fresh fish from the sea, and much more. And each meal is often followed by an unordered, generously provided dessert or an aperitif of ouzo or mastika. Once seated, you might find yourself being stalked by one of the many cats on the island, begging for a scrap from your meal. And while dining you might also spot the island’s pet pelican, or even a resident riding by on a horse or a donkey. There are many historical sites to be seen on the island … elaborate churches, a monastery, and several archeological, maritime and agricultural museums. But some of the most striking are the enormous white windmills. Harnessing the powerful northern winds from the coast they have been used to grind grain since the 17th Century. Today many of them have been preserved and turned into either residences or museums. Other places of interest on the island include the small village of Ana Mera most famous for the beautiful byzantine church of St. George, as well as the beautiful Elia, Agios Ioannis, and Ornos beaches which can be reached by public transportation, taxi or private auto. Like Mykonos, Santorini can be reached by ferry or plane. Made up of red and brown volcanic cliffs, where blue-domed churches and traditional whitewashed villages reside atop the Caldera (a cauldron-like volcanic feature usually formed by the collapse of land following a volcanic eruption), the island is a breathtaking and picturesque place. Perched high atop this mountainous terrain is Santorini’s capital Fira, whose cobbled streets lead to bars and restaurants built on terraces descending the cliff’s face. The old Santorini harbor (once the only stop for boats visiting there) can be accessed from Fira by traversing one of the island’s most famous landmarks, the 588 steps. An extremely steep ascent and descent, these narrow steps can be traveled by foot, cable car or donkey. It was advised that one should take the cable car down and the donkeys up, as walking can be precarious when trying to avoid animal droppings. A little farther north at the tip of Santorini the traditional village of Oia extends a warm welcome to visitors, offering a labyrinth of cobblestoned lanes leading to unique shopping in unusual boutiques. Famous for its view of the Caldera, it is said to be the place to behold the most beautiful sunsets in the world. On the other side of the island, those seeking a more casual atmosphere will find the cosmopolitan beach town of Kamari the place to be. Offering a wealth of cafes, bars, restaurants, shops and supermarkets, as well as a lively nightlife, this village spreads out along a crescent bay under the shadow of Mesa Vouno (an enormous rock that rises from the Aegean Sea). As is true in Mykonos Town, visitors strolling leisurely along the stone-paved promenade of the black sand beaches are accosted by restaurant proprietors urgently encouraging them to patronize their establishment. Famous for its cherry tomatoes, an island favorite is the Santorini salad (cherry tomatoes, red onions, kalamata olives, capers, feta cheese and olive oil), along with tomato fritters and melitinia (sweet cheese pastries made with mitzithra cheese and yogurt). Many of these establishments are family-owned, and under the watchful eyes of elders dressed head to toe in black, owners’ children frequently run and play along the promenade until all hours of the evening. History buffs will be interested in walking around on the volcano responsible for creating the island, as well as visiting the architectural and folklore museums, archeological sites and beautiful churches there. When we first arrived in Greece, at the Athens airport we were told that our pre-planned itinerary had been slightly altered because the Greek populace was demonstrating against the country’s financial failings. Therefore our anticipated tour of two of the most historical sites in the city, the Acropolis (highest city) and Parthenon (temple dedicated to the Greek Goddess Athena) would be re-routed to the Acropolis Museum (site of ancient treasures and archeological excavation), the Agora (ancient Grecian marketplace) and the adjacent village of Plaka (the oldest part of the city … auto free). Then … upon completion of this altered city tour … we were told by our guide that the metro, buses and taxis would stop running everywhere in the city at 4 pm, so we should make plans for returning to our hotel around that timeframe. Abiding by that advice, after lunch and shopping for souvenirs in Plaka, my daughter-in-law and I entered the underground metro station at about 3:15pm, and before we knew it found ourselves below a demonstration that had turned into a riot. Unbeknownst to us a mob had set fire to a bank and tear gas was dispelled by the local police to quell the disturbance. That gas filtered into the metro station where we were changing trains. People were running everywhere and many hopped onto our train with wet cloths over their faces. Fortunately we only experienced a minimal burning in our eyes as our train immediately left the area, and we were soon safely back at our hotel on the outskirts of the rioting. Gate 1 Travel offers discounted escorted tours, European river cruises, independent vacations and customized international vacation packages. They can be reached at www.gate1travel.com.